Budget credibility describes the ability of governments to accurately and consistently meet their expenditure and revenue targets. 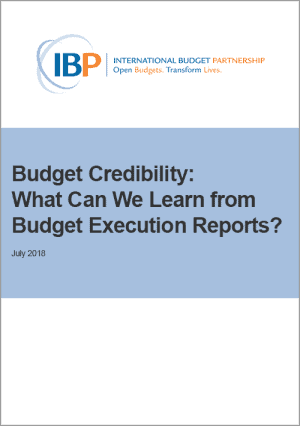 This paper approaches the issue of budget credibility from a transparency perspective, looking at the extent to which budget execution reports (In-Year Reports, Mid-Year Reviews and Year-End Reports) include detailed information comparing final outturns to original budgeted amounts for expenditure and revenue, and explanations for any significant deviations. The analysis focuses on publicly available budget documents collected through the Open Budget Survey for 24 countries. The majority of countries analyzed do provide budget credibility data – in particular in Year-End Reports – but analysis and explanations of deviations are a lot less common.